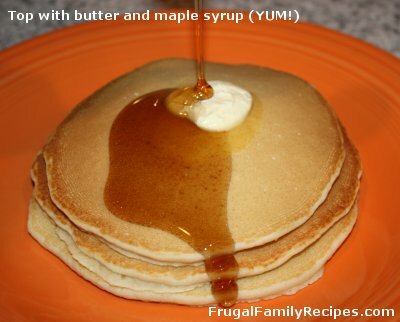 Frugal Family Recipes From BetterBudgeting: Easy Homemade Pancakes - Light, Fluffy, Perfect! 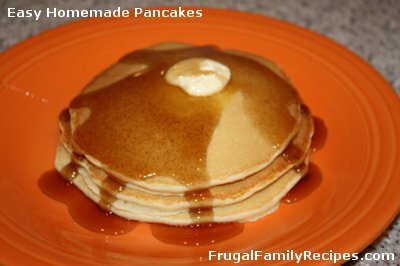 Easy Homemade Pancakes - Light, Fluffy, Perfect! You know what makes an easy and fun frugal dinner? Pancakes! 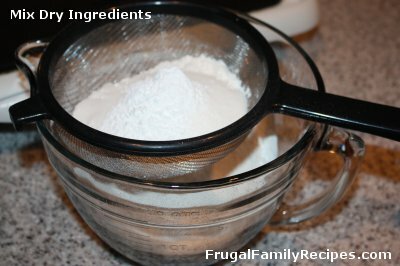 If you regularly use a store bought pancake mix I invite you to try our family's easy homemade recipe. It never fails. No buttermilk on hand, no problem. Our recipe uses regular milk and tastes just as good as 'buttermilk' pancakes. 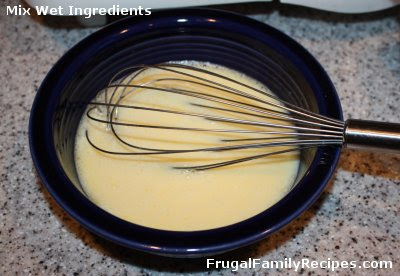 Add cinnamon, vanilla, or fresh fruit for variations. 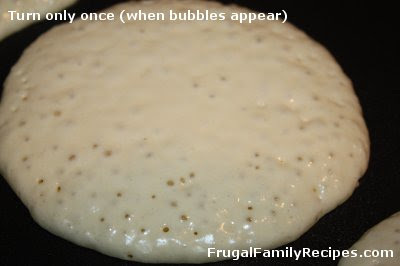 I've been making these pancakes for about 30 years. We like to add fresh blueberries (not frozen or they'll turn the pancake batter blue), or our favorite... chocolate chips. Our pancakes are so light and fluffy, they're even good without butter or syrup. 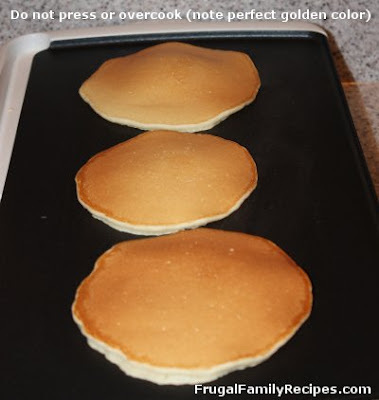 You can also dust finished pancakes with powdered sugar instead of butter and syrup, or add 1 T. cocoa powder to the batter for chocolate pancakes--with or without chocolate chips. OH MY LORD!!! Our recipe makes about 6 large (5-inch) pancakes. For our family of six I usually double the recipe for 12 pancakes. Heat non-stick griddle to 350. 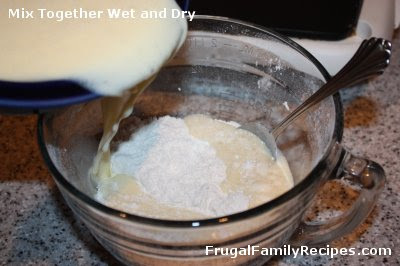 Stir together wet and dry ingredients, just until combined. 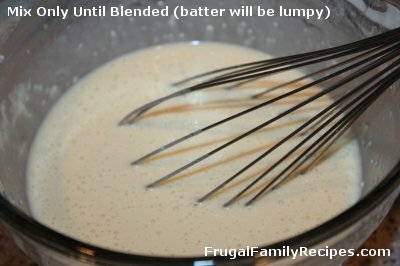 Batter will be a bit lumpy. Pour batter onto griddle (or lightly greased skillet) in the size desired. We usually make large pancakes but sometimes we make small dollar size pancakes, about 3".